Over sixty worshippers came to pray with Women of the Wall at Rosh Hodesh Elul prayer service this morning at the Western Wall. After months of praying with a Torah, this time the Torah we brought was confiscated by security guards at the entrance. It was distressing. Our fearless board member Rachel Cohen-Yeshurun attempted to retrieve a single replacement Torah scroll from the over 150 scrolls that are kept in the men’s section and was stopped by plain-clothes police officers. As a result, Lesley Sachs, Women of the Wall’s executive director, was forced to celebrate her Bat Mitzvah without a Torah scroll from which to read. Lesley Sachs has been arrested for holding a Torah, has traveled around the globe with a Torah, has taken the Torah for rabbinic inspections and practically done everything one can do with a Torah, today had a first opportunity to celebrate her connection to the Torah and read from it in public. This, she was prevented from doing. 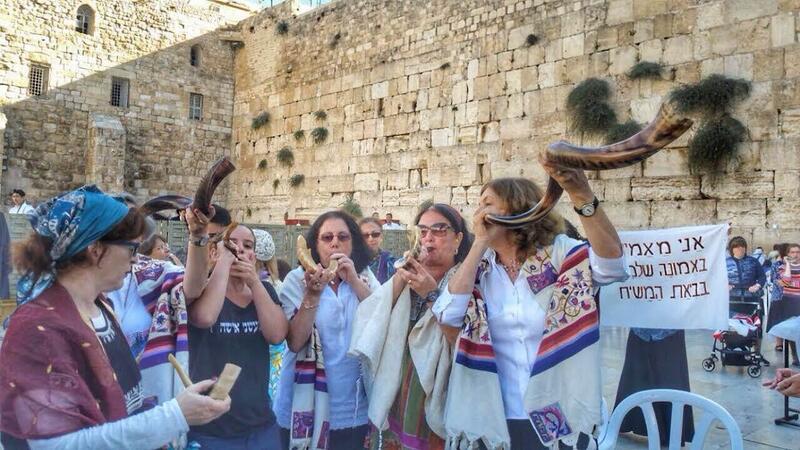 The Western Wall Heritage Foundation ushers even tried to confiscate the shofars we brought , and only my personal intervention forced the authorities to follow the law and allow us to proceed with them. The ultra-Orthodox protesters – who harangued and heckled us, swore, banged on wooden lecterns – and the endless shrieks of whistles were not stopped by the ushers who mingled amidst the crowd. The police, once again, did nothing. The police’s new policy is that they not interfere directly with hecklers who interrupt our prayers. The entire public sphere has been turned over to the bullies and the ushers representing the Western Wall Heritage Foundation- – with predictable results. At no point were we able to pray in peace. Our New Year resolution is to follow Rachel in pursuing the Torah, to follow Lesley in a deep commitment to the text of the Torah, and to follow our dream, to liberate the wall and make it accessible to all. As we sang Israel’s anthem, Hatikva, with the words “to be a free people in our land,” we were joined by countless Israelis who are hanging on our every move. With best wishes for sweet and wonderful New Year.